Today is General Tso’s birthday, and to honor that fact Panda Express is giving away a free chork with every purchase! So we’re not yet sure if these are limited-edition or if they’ll become as commonplace as fortune cookies, but Panda has abandoned ambitious innovations in the past. In 2012 they introduced the Paw Plate, a dish that offered three smaller-portioned entrees for the price of two, but recalled it apparently due to low sales. Later select locations offered the delicious-but-life-shortening orange chicken with bacon, which somehow apparently didn’t catch on well enough to become a standard dish. So I’m grabbing my chork today just in case they don’t survive the test of time. This guy’s totally right though: Why didn’t they call it forkchops? Update: So I got my chork, and I have to report it’s actually pretty difficult to use. The food tends to slide off the sticks, and more than once I failed the balancing act of bringing a piece of orange chicken from the plate to my mouth, and this is coming from someone who can proficiently use a normal set of chopsticks. The problem is that they’re smooth plastic, wooden chorks would do better but I don’t think wood forks are really a thing. Speaking of the fork half, it does its job perfectly well, though the chopstick half is a bit awkward to hold onto as a handle. 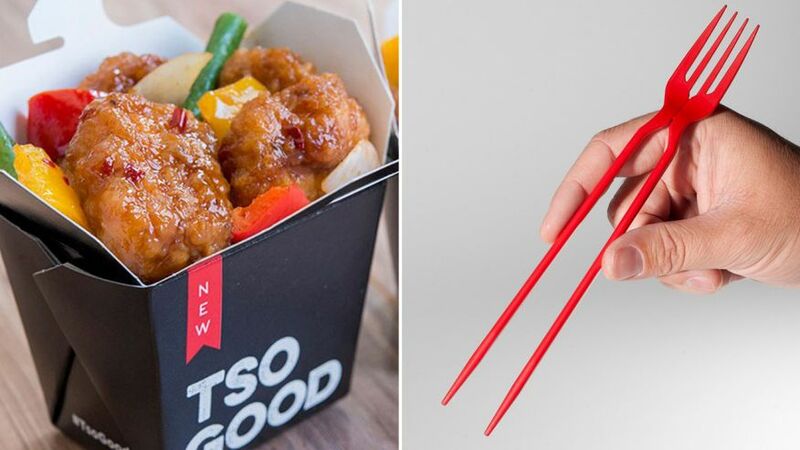 I should also note that I normally eat my Panda meal with a toothpick because for whatever reason I prefer spearing my food like a shish kebab, so I might not be the most unbiased of customers, but I’m likely to keep eating my orange chicken with a toothpick.